Spray painting is a valuable painting tool that saves you both time and money. With a spray rig you can turn your jobs in days instead of weeks. If you want to paint new construction, decks, exterior siding, rough surfaces, etc. you can make a lot more money because you can turn your jobs faster compared to brushing and rolling. Spraying irregular surfaces like decks and lattice make spray painting a super fast method. About 4 times faster than brushing. Two times faster than rolling. Spraying offers uniform coverage. It evenly applies over smooth and rough surfaces. You can add accessories where needed to save even more time. You can spray most common coatings and even use a rolling attachment if back rolling is needed. How many gallons a year will you spray? What types of coatings will you use? 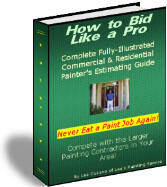 But a painting contractor will tell you to buy a smaller spray unit for stains and varnishes and a medium size or larger unit for interior spraying, rolling and for exterior use. With a large sprayer you will be able to use the largest spray tip which gives the largest fan of spray and delivers the most paint coverage. A medium sprayer may only be able to use a mid-range of spray tips, which won’t be quite as wide of a spray fan. Also it depends on what jobs come your way. If it’s a light job using stains, go with a small airless paint sprayer first. Use your down payment to buy it and let the job pay it off. Your owner’s manual and possible DVD will show you how to run your new spray rig. It will also tell you about “spray tip life”, and which coatings to use for each spray tip. An airless paint sprayer is basically just a pump, airless hose and a spray gun. The paint is pumped through to the spray gun and forced through the spray tip, which produces various spray pattern fans depending on the tip and the material being sprayed. The Neatest Thing About Airless Spray Painting Is That It Produces Hardly Any Over Spray. Since no air is used to force the paint out, there is very little over-spray and the air in the room is not filled with paint fumes. The same advantage goes for exterior spraying as well. Once you buy your spray system the owner’s manual will show you which spray tip to use for each type of coating, what the tip life is, how much pressure to use etc. Some spray rigs are “gas powered”. You will probably want to stay with the more common electric powered sprayer. That way you can use it indoors, and it will be less noisy as well. A 5-gallon bucket to mix all your paint together in, (boxing), so you have the same tint color throughout the job. Masking tape, rolls of paper and painters plastic to mask off areas not being painted. A shield (keeps spray away from certain areas when spraying). A respirator or spray mask. A baseball cap and a long sleeve shirt. A "tip extension" and/or heavy-duty extension for the gun. (These screw onto the gun allowing you extended reach without needing a ladder (can speed up painting process even more). There are pressure roller kits and extensions as well if needed. Use rolls of maskting tape, paper and plastic sheeting to block out areas not to be painted. Use a shield to also block areas while spraying. Don't spray in people's homes or offices. If you have a lot of continuous wall space to roll out use a power roller attachment. Lightly cover plants and schrubs when painting around them. 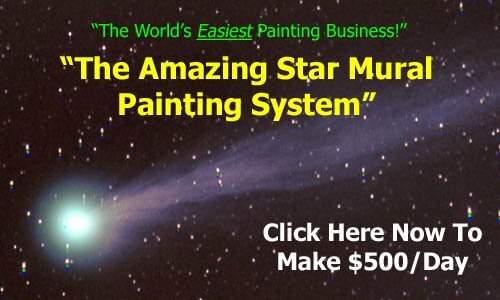 Enjoy this article for spray painting? Go here for more handy tips.